ever since i ate that life-altering vegan big mac and discovered doomie’s has a secret menu, i have made it my mission to try everything on it. since it’s pretty giant and not actually written down anywhere, it will be tough to track my progress on the secret menu, but i’ll try! i started on sunday with the “buffalo chicken sandwich”. 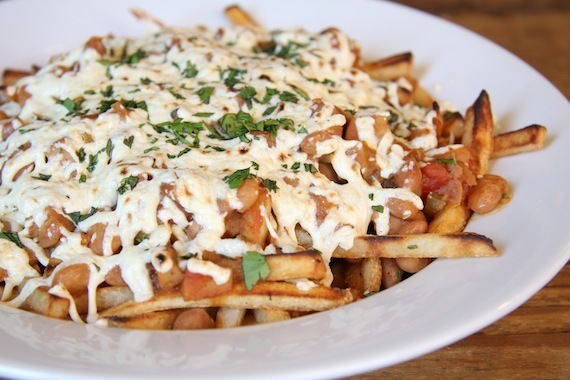 new secret vegan chili cheese fries at m cafe! new vegan sandwich being tested at mendocino farms on friday! EAT IT! hey everyone, just a quick post to let you know that mendocino farms is testing a new vegan sandwich tomorrow…a mushroom seitan sloppy joe…and you should go show it some support. 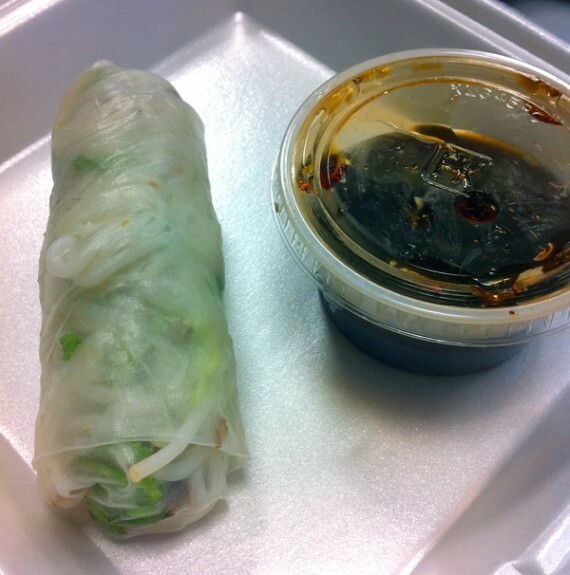 if it does well, they may extend its run or even add it to the regular menu! i haven’t had a chance to try it yet, but it was available today at all mendocino locations and is going to be around tomorrow as well…hopefully longer. i am already a huge fan of mendocino farms’ vegan sandwiches, so i’d love for them to add another one to the list. a reader sent me this mendocino farms facebook update today about mendo’s new vegan mushroom seitan sloppy joe and i called the restaurant immediately. the dude on the phone was super helpful and told me this was just a result of chef judy getting “creative in the kitchen” and that they wanted to test the sandwich for a couple days on customers and see how it does. he told me it would definitely be around tomorrow (friday), and if response is good, possibly longer. LET’S MAKE SURE THE RESPONSE IS GOOD. 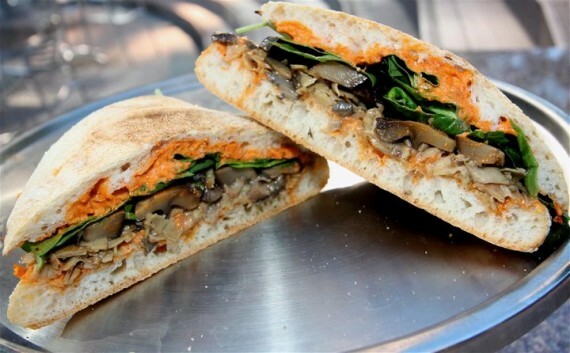 i need more mushroom-flavored seitan and portobello confit sandwiches in my life! seriously, mendocino makes the kind of fresh fancy food that vegans should be eating. it’s all made from crazy top-notch ingredients and is super fresh…as they say on their website “we like to try to reconstruct “Fine Dining” entrees to the sandwich level and take classic regional sandwiches and give them a modern interpretation.” if you have ever tasted a mendocino farms sandwich, you’ll know that’s true. so please, vegans, get to mendocino farms on friday! they’ve got 2 locations downtown and one in marina del rey. let’s flood them for orders with vegan sandwiches. 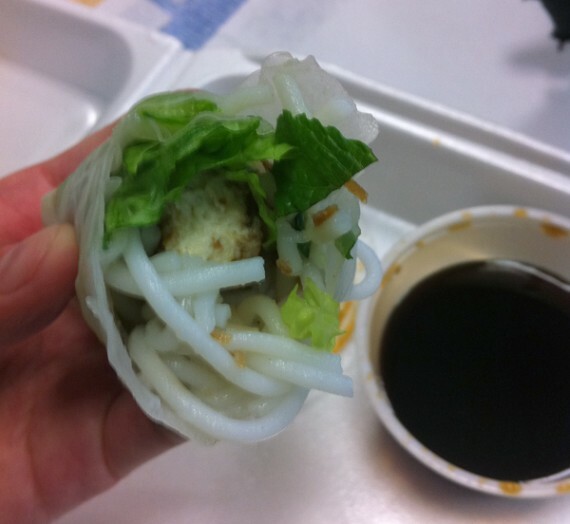 and if mushroomy seitany sloppy joes aren’t your thing, they also have a vegan dosa wrap and a vegan soyrizo wrap. (just be sure to specify that you want a tortilla with no honey!) basically, all vegans should go and taste the amazing-ness that is mendocino farms! yalla truck’s vegan firestarter sandwich! WOW! i’m becoming obsessed with yalla truck. i was already convinced that the all vegetarian food truck made some of the best falafel sandwiches in town…and then they had to go and blow me away with the incredible firestarter, a “secret” menu item. now the firestarter isn’t completely secret, after all it is listed on yalla’s facebook page, but you won’t find it on the normal menu outside the truck. ask for it anyways though, and you won’t be sorry. the firestarter is the best sandwich i’ve eaten in ages, and even though i loved the andale at yalla, this spicy little pita has it beat. 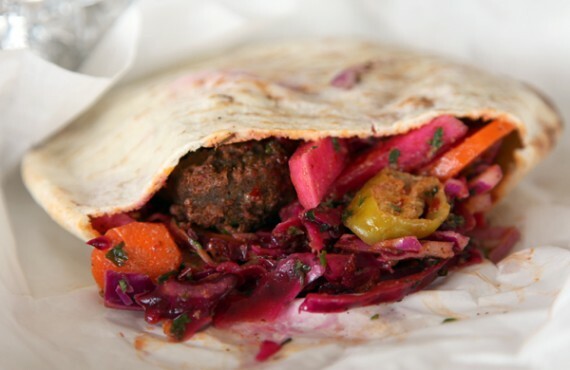 it’s filled to the brim with tiny freshly-fried falafel balls, red cabbage salad, pickled turnips, pepperonchinis, onion salad, and pickled carrots…all tossed in an incredibly hot blend of chili paste and tahini. YEOW! this thing did start a fire in my mouth, and i am hooked! you can’t tell from the picture, but the sandwich was so full that ingredients were spilling out all over the place. i’m talking loads of crispy falafel and all kinds of marinated flavorful vegetables. plus it was SPICY. ahhhh i wish i had another one right now! 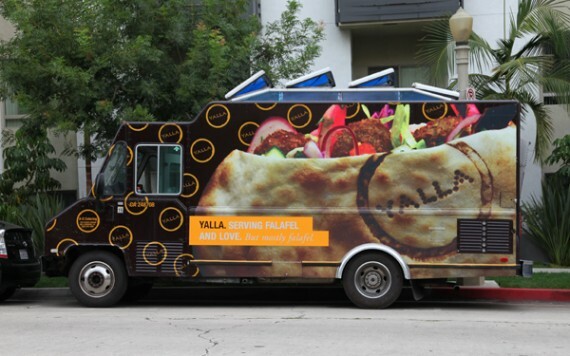 if you like falafel, and you haven’t tried yalla truck yet, you need to hunt them down ASAP! follow them on twitter for their schedule and make it a point to hit them up. 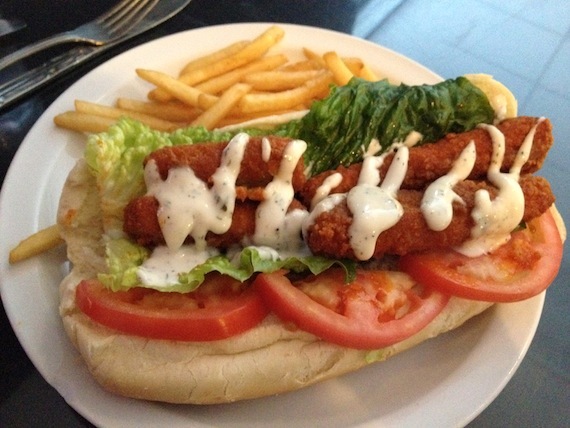 you will be sure to get one of the best falafel sandwiches you’ve ever eaten. make it the firestarter! 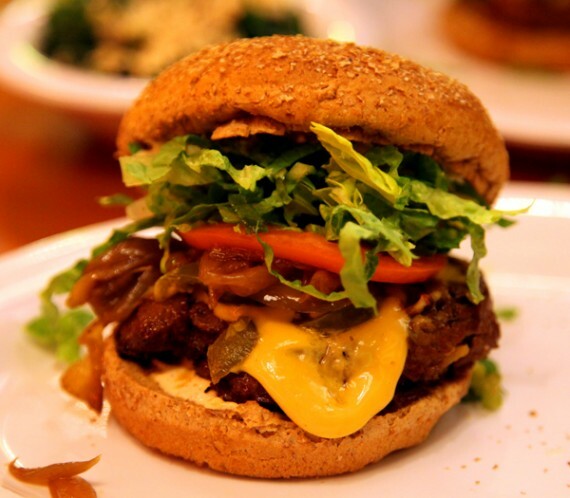 veggie grill has officially joined the ranks of cool fast food chains by offering a “secret” off-menu item that you have to be “in the know” to order.